South Texas Podiatrist (San Antonio) - Book Appointment Online! If you're looking for heel pain relief, bunion care or other podiatric services in Southern Texas, we welcome you to our practice. 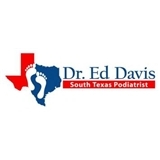 Dr. Ed Davis is a podiatrist in the San Antonio, Texas and southern Texas areas, who believes that a doctor and patient become a team for treating an individual's feet. Dr. Davis and his staff spend most of their time listening to understand your concerns and responding with the best treatment options for you.